The company has also taken extra care about the little details such as better and faster syncing, smaller charging case which is convenient to carry along. 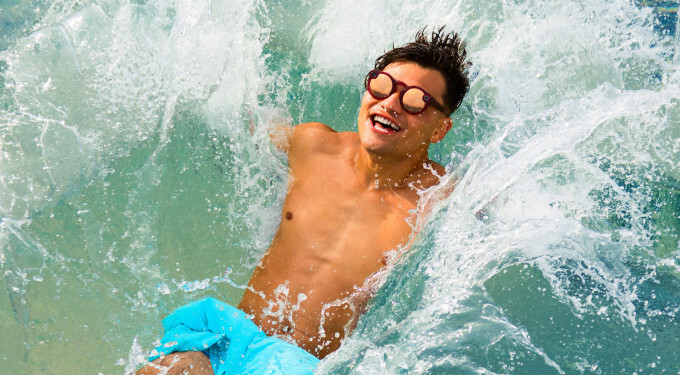 Having said so, Spectacles 2.0 can now be worn as a tool to unleash your creativity; One that allows you to take photos at the beach with waves crashing on you without looking weird (no more yellow rings). 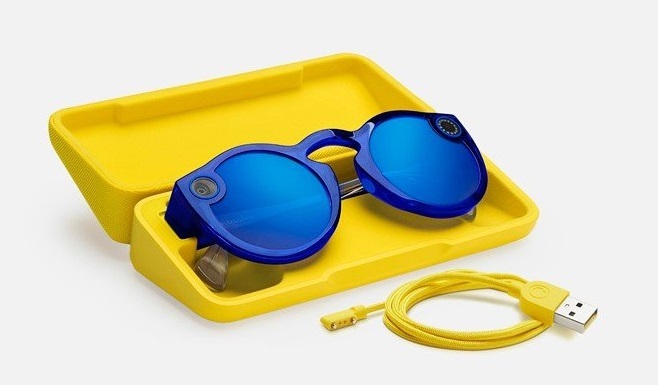 That's not all, the team behind Snapchat Spectacles 2.0 also made sure that wind noise can be reduced exponentially when you are shooting videos with your glasses. 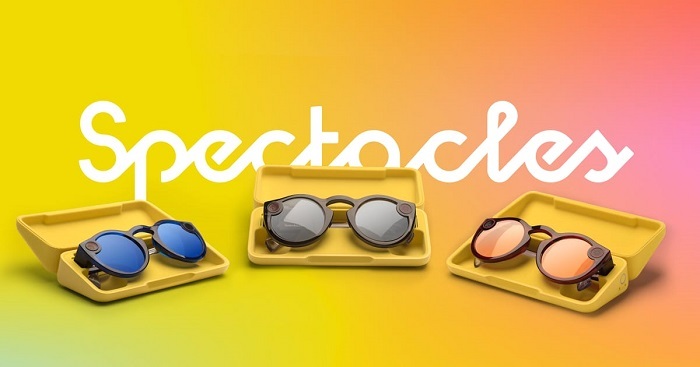 The moment you take your glasses out from their tennis ball box, you can immediately know that Spectacles Version 2.0 is built to last as it is of high quality. The yellow case which has been shrunk can fit snuggly into your pocket when you hit the beach while holding your surfboard. The battery has also been improved meaning that you can record and transfer up to 70 videos in more than one week which can be considered relatively good for a wearable. It is easy as 1-2-3. 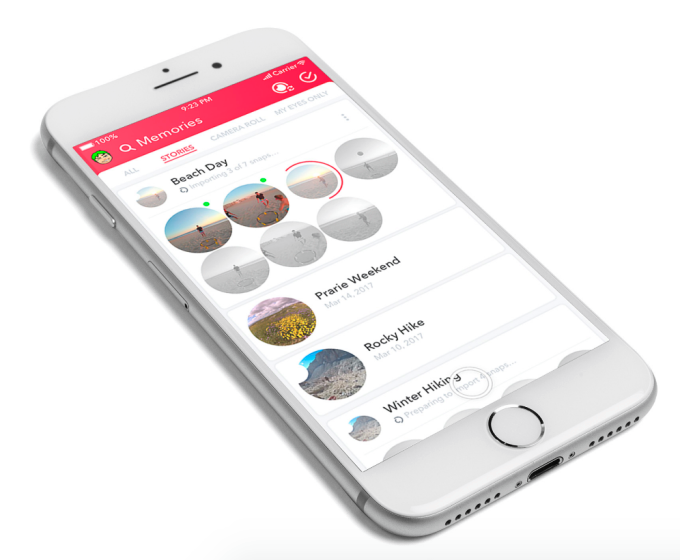 Long pressing allows you to easily snap a photo while a tap will shoot a 10-second video clip for you. Not long enough? Just tap a few more times and the video can be extended to 30 seconds. SnapChat has added an extra microphone to help reduce wind noise and equalize conversation so that the wearer does not sound too loud in the video. How about resolutions and qualities of photos and videos? Photos can be vividly capture at 1642 x 1642 pixels while videos are recorded at 1216 x 1216 pixels. Not bad at all aye? Transferring photos and videos is 4x faster now. 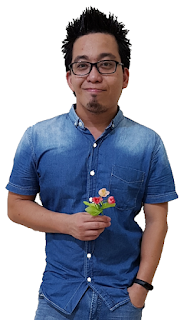 To sync your pictures and videos between Spectacles Version 2.0 and your smartphone, you just need Bluetooth connection now. A 7-second long press of the shutter button is all you need to start transferring your photos and videos. Exporting your priceless moments now happens in HD and it is 4 times faster than Spectacles V1. Vast improvement if you ask me. 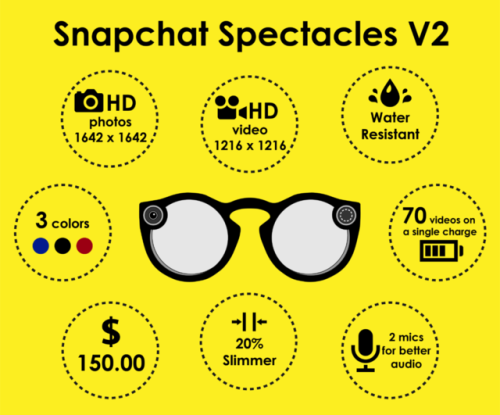 SnapChat Spectacles 2.0 at a glance.